If you’re like me, you may have had the unfortunate experience of struggling to push your child’s stroller over a grassy, sandy, bumpy or otherwise unforgiving surface while feeling sorry for your little one as they bump and bounce along. Fortunately, having the right equipment can make experiencing those great outdoor moments easier. The off-road stroller options available today are growing as more and more parents want to share an active lifestyle with their children. These strollers feature smart designs that can comfortably handle almost any environment. Here are some answers to common questions about off-road strollers and more details about four popular models. What is an Off-Road Stroller? Are Three Wheels Better Than Four? 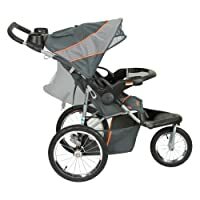 How To Choose Your Stroller? The terms “off-road” and “all-terrain” are frequently used interchangeably to refer to strollers that have a three-wheeled design with one swiveling front wheel and two rear wheels. The wheels are significantly larger than traditional strollers and have tires made out of air-filled rubber, like a bicycle or car tire. Additionally, an off-road stroller typically has a pretty impressive suspension system. These strollers are built for performance and make for a smooth ride for your child. They are also much easier for a parent to push on a variety of surfaces and allow you to take your child along while jogging. 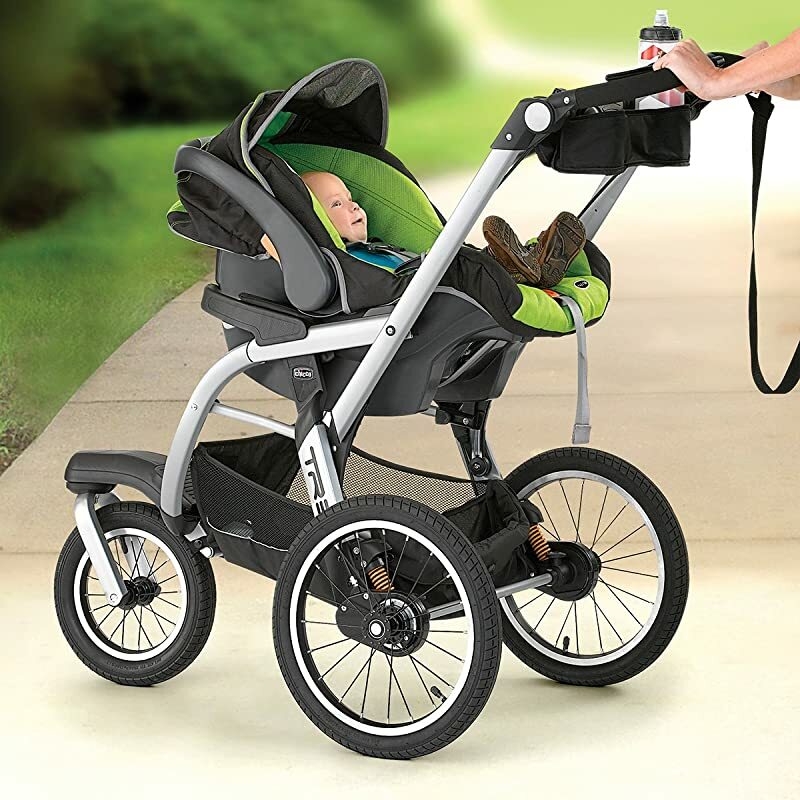 An all-terrain stroller has many similarities to a classic three-wheeled jogging stroller with the exception of the front wheel design. 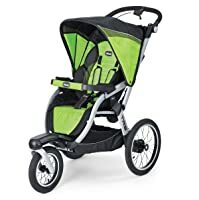 A jogging stroller’s front wheel is in a fixed position to cut down on drifting and correcting while in motion, allowing you to focus on running. 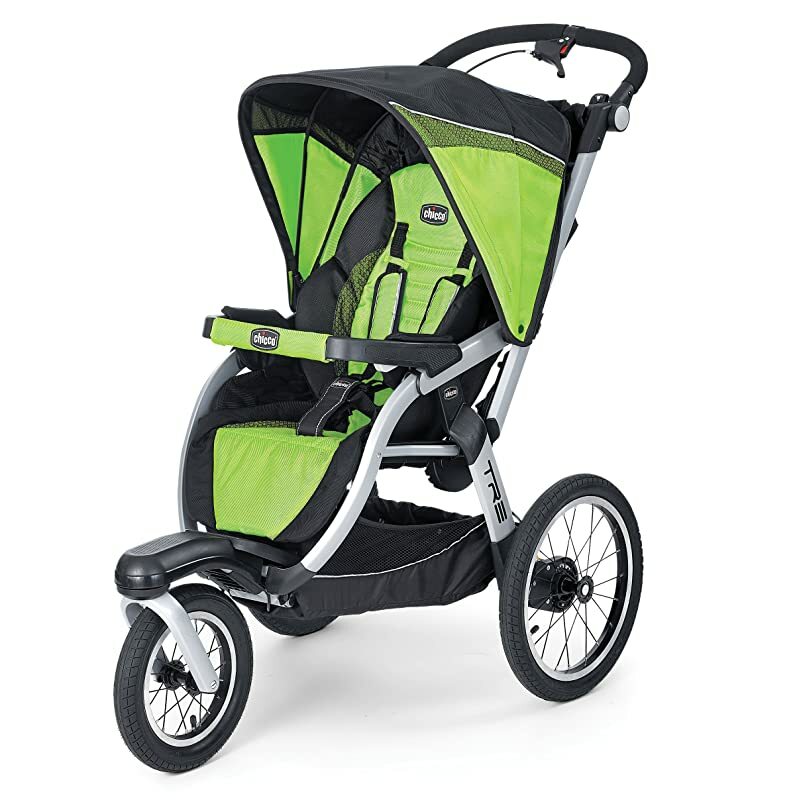 Great for safety, not so great for getting around tight spaces when you’re off the jogging trail. An all-terrain stroller provides more versatility. The swiveling front wheel makes steering a breeze while an easy-to-use mechanism securely locks the front wheel into a stationary forward position. Traditional stroller models have typically been fairly basic designs with four small, plastic wheels and were mostly limited to flat surfaces like smooth sidewalks and streets. The large rubber tires on an all-terrain stroller easily roll over a variety of surfaces and also provide some shock absorption. Four wheels usually have the stability advantage as they provide more points of contact with the ground and a lower center of gravity. However, off-road strollers are designed to compensate for this with widely placed rear wheels that are about 25% larger than the front one. This shifts the center of gravity lower and ensures a stable structure. A three-wheeled stroller with a swiveling front is unbeatable for maneuverability and turning on a dime. 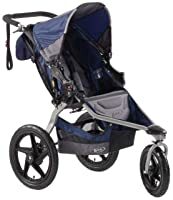 All-terrain strollers also offer the option of easily locking the front wheel if the situation requires, while four-wheeled strollers lack this feature. Billed as a multi-surface option, the BOB Revolution SE is a great choice for sharing a variety of outdoor activities with your child, and with its smoothly swiveling front wheel and sleek design, the SE is also easy to maneuver even in tighter indoor spaces like a store or museum. 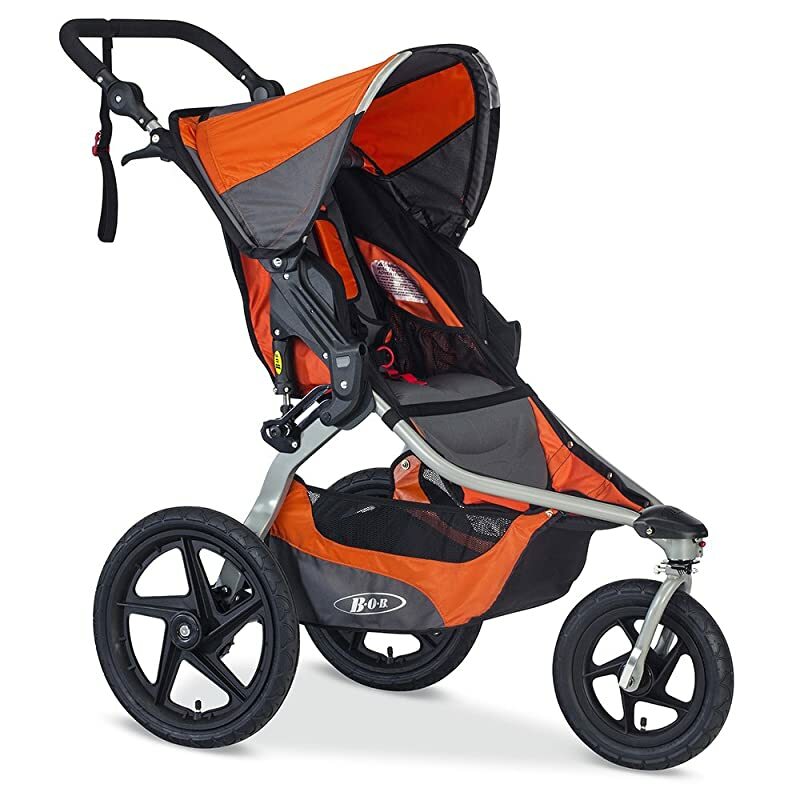 The Revolution SE’s wheels are the large size typical of all-terrain strollers at 12 inches in the front and 16 inches in the rear. All three rubber tires contain pneumatic tubes to cut down on bumps, and the truly remarkable suspension system absorbs any remaining shock so your child can sit back and enjoy the ride. The SE is surprisingly lightweight at just 25 pounds, thanks to an anodized aluminum frame. The SE features a smart, two-step folding design that is beyond easy to collapse and set up. The wheels are also removable in case your trunk or backseat is a little on the snug side. Convenience features include a spacious storage bin underneath the seat and mesh storage pockets behind the seat. Two interior pockets on either side of the seat hold your child’s belongings. The handlebar is 40 inches tall and has a comfortable rubberized foam grip. 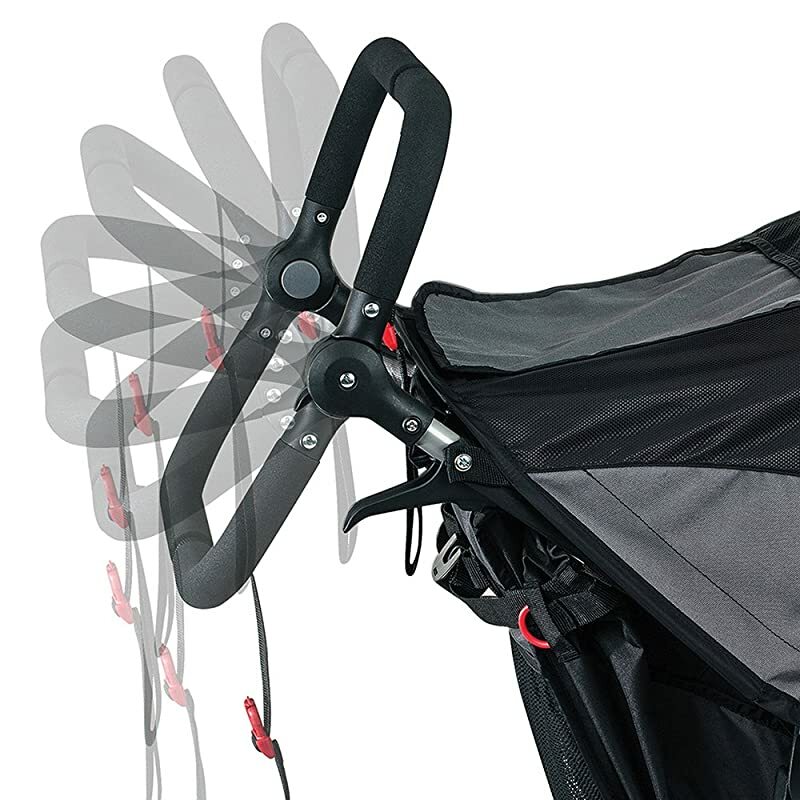 The canopy contains a clear plastic panel so you can easily keep an eye on your little passenger. A hinge allows for multiple sunshade settings and is also fully collapsible. Safety features include a secure five-point harness system, a rear parking brake that is easily engaged with the touch of your foot and a locking switch to set the front wheel to a stationary position. One drawback may be the price. BOB strollers are known for their great design, comfortable ride and quality construction, but they do tend to be quite expensive. The Revolution SE has an upper weight limit of 70 pounds, and available color choices are Black and Navy. The BOB Revolution FLEX contains many of the same comfort, safety and performance features as the SE model. 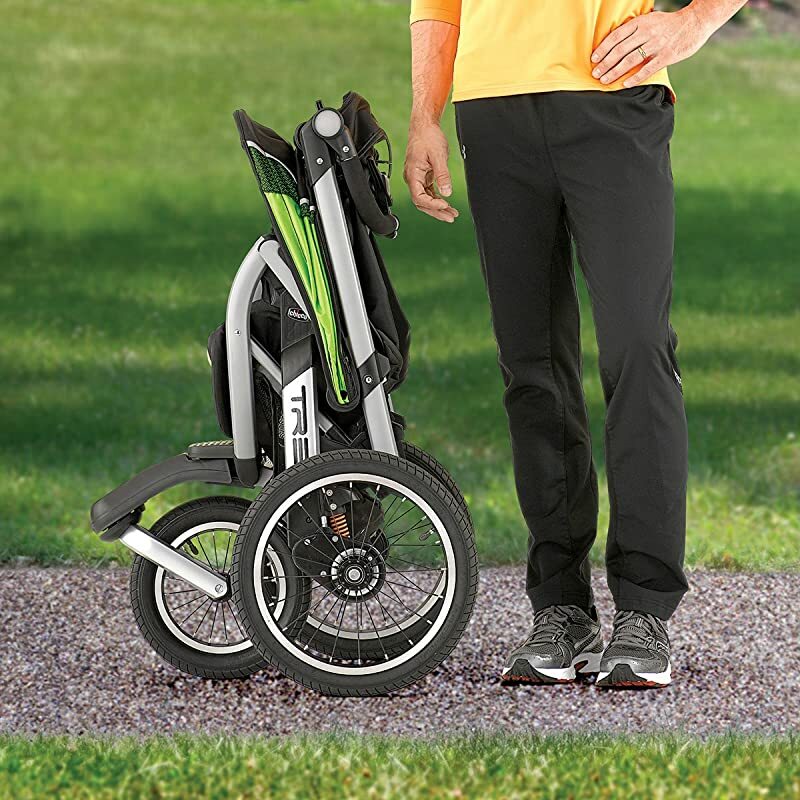 The FLEX’s large, air-filled tires, swiveling/locking front wheel, five-point harness and quick-folding design make it another great option for jogging or strolling on a variety of surfaces. One of the biggest differences between the FLEX and the SE models is the handlebar design. The FLEX offers nine settings with a height range of 34.5 to 48 inches, which should provide a comfortable setting for almost any parent. Easy-to-push buttons make adjusting the handlebar quick and effortless. The FLEX is offered in more color choices than the SE with Black, Canyon, Lagoon, Meadow and Red being solid color options. The gray-and-white pattern Lunar is also available. Weighing in at 28.5 pounds, the FLEX is a little heavier than the SE. The FLEX is capable of carrying a bit larger child and has an upper weight limit of 75 pounds. The TRE from Chicco offers a large set of safety, convenience and performance features that make it a great option that costs less than most models of the BOB all-terrain stroller. One of the most notable features is the convenient “Control Console” located just in front of the handlebar. This console contains a small storage bin between two cupholders and easy-to-use hand controls for locking and unlocking the front wheel, using the decelerating brake and setting the parking brake. The handlebar adjusts to four height settings. A quick-release folding mechanism is located just in front of the console. Storing and transporting the TRE is simple with three fold-down options. The self-standing setting is ideal for short storage in a closet or garage between regular uses. The trunk setting fits easily in most vehicles. The storage setting is the most compact and is intended for longer-term storage. The sunshade contains both a plastic and a mesh window and extends from a totally flat position to one that covers most of the seat area. The seat has five degrees of recline that are easily controlled with a one-handed mechanism. 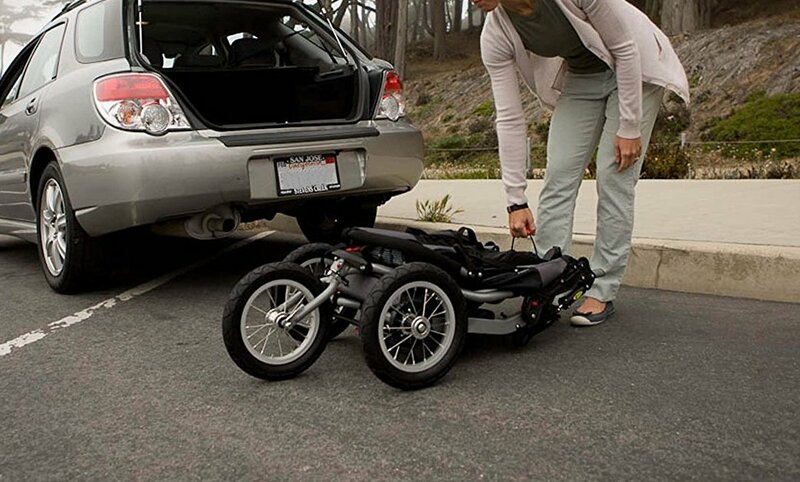 Large 16-inch rear tires help take the edge off of a bumpy surface while an adjustable suspension system takes care of the rest and allows you to tailor your child’s ride to the environment. The TRE is fully compatible with the Chicco Keyfit and Keyfit 30 car seats. The canvas fabric is also completely removable to transform the TRE into a frame stroller that doubles as an infant travel system. The TRE weighs 28.5 pounds and can be used for children weighing up to 50 pounds. Two color options are available, Titan and Surge. Watch the demo below if you need to know more about this stroller. The Baby Trend Expedition contains several convenient features that make it a good basic, more affordable option. The handlebar is encased in a rubberized grip for comfort and has a fixed height of 41 inches. Just in front of the handlebar, a lidded storage bin and two cupholders can house your phone, water bottle or other small items. Another tray in front of the seat has two cup holders for your child’s bottle or snacks. 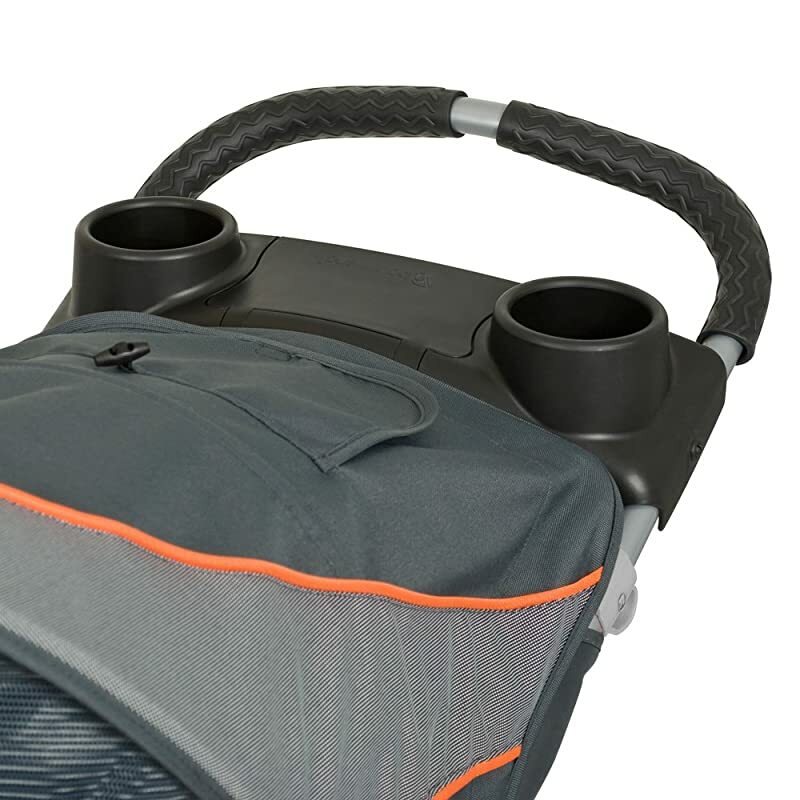 The tray can also hold any Baby Trend infant car seat to turn the Expedition into a travel system. The hinged front tray easily swings up and out of the way when not in use. Quick-release buttons allow the Expedition to easily fold in half for storage and transportation. The Expedition is still fairly large even when folded down, so be sure to measure your cargo space in advance. The seat is easily adjusted from upright to nearly flat in case your child wants to take a nap during their ride and a five-point harness keeps them secure. A spacious cargo bin under the seat accommodates those extra items that parents and little ones always seem to require. 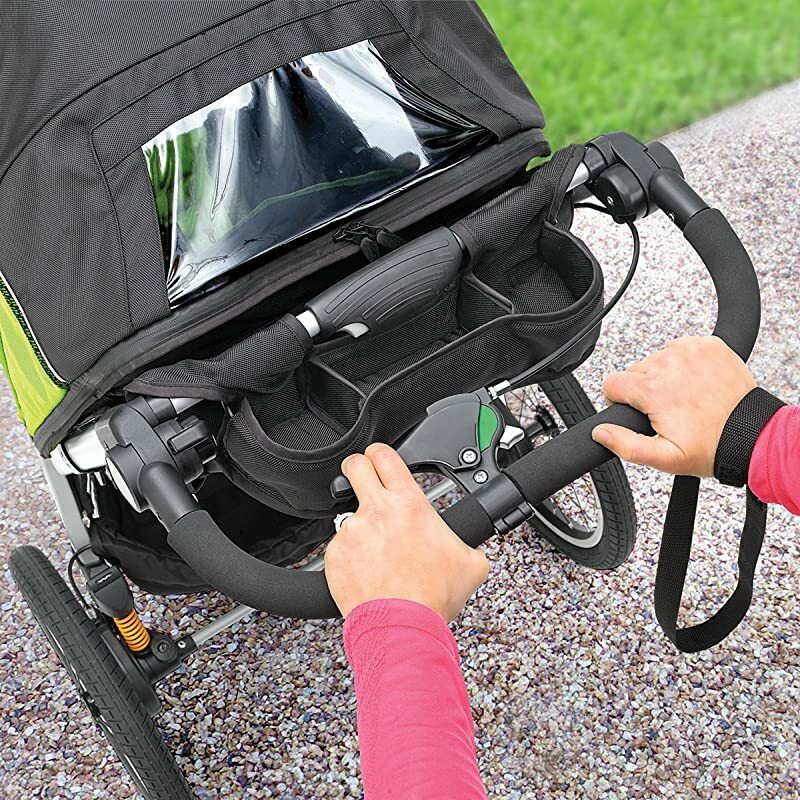 The front wheel locking mechanism is a simple switch located on the front of the stroller. The canopy is on a ratchet hinge that allows for multiple positioning options. The Expedition weighs 26 pounds and has an upper weight limit of 50 pounds. Five color choices are available: Vanguard, Bubblegum, Carbon, Elixir and Phantom. Jubes26’s reviewed this stroller in a video, you can watch if you need to know more details! With so many options available, choosing the best all-terrain stroller for your family may seem like a daunting task. Here are some points to consider that may help you narrow the playing field. Are you an avid athlete? A high-end model with all the bells and whistles might be a great choice if you want to take your child along on your regular jogs. How big is your vehicle? Some models fold down more compactly than others, so researching dimensions and measuring your trunk or cargo space may be a smart move. How tall are you? Most parents find fixed position handlebars to be comfortable and easy to use. However, if you are very tall or very short, a model with an adjustable handlebar height might make a big difference for you. How much are you willing to spend? Prices vary widely, but the good news is that great options are available at all price points. Photo & Video credits: Amazon, ExcelDriveVideo, The Baby Cubby, ChiccoUSA, Jubes26, Header Photo Designed by Freepik, Pin Image Designed by alluregraphicdesign.